For a variety of reasons, many people wish to keep their cat as an indoor pet. As with humans, sometimes life indoors can become boring for cats (and stressful) if there’s not enough to interest them or keep them entertained. 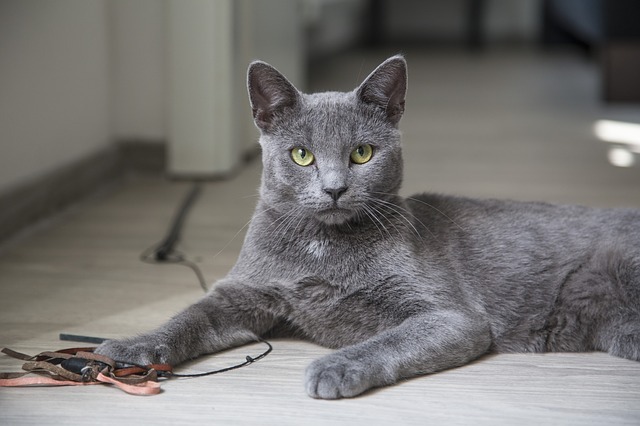 Indoor cats could be prone to anxiety and weight gain, especially if they have previously been used to having outside access and are now an indoor only cat due to circumstances. They can also experience more stress by changes to their environment as they spend all of their time indoors. Here are our top tips for helping your indoor cat(s) to be happy and healthy! Indoor cats can easily become overweight as they may have less space to be active in. You may also be using the “free feeding” method of leaving their bowl out all day and topping it up when it starts to get empty, then it’s really hard to get a true idea of how much your cat is eating, so if your indoor cat is already overweight, this could be the culprit. Discuss with your vet about trying specific indoor cat diets, which might be better in maintaining a healthy weight for your cat as they tend to be lower in calories and fat. Ensure that playtime is stimulating and appeals to your cat’s natural hunting instincts. This is particularly important for indoor cats, who don’t get the same opportunities to engage in this kind of activity outside of the home and also tend to have much less active lives in general. These kind of games can be as simple as chasing a piece of string as “prey”. For the most part, indoor cats rely much more heavily on you to keep them active so it’s very important to spend time playing with them – preferably on a daily basis. It’s also likely that you will be their main source of company too, especially if they are the only pet in the home. This makes it particularly key that you spend time with them when you can so they are less likely to feel bored and stressed by their indoor life. Cat trees can also provide some climbing access and a different view of the world, which can mix things up for your cat. Scratching posts can save your furniture from being shredded. You might find it useful to have more than one in different parts of the home so your cat can use them when the mood takes them. If you’re not convinced they will actually use a scratching post, catnip can be a useful incentive. Litter trays can be another area of concern. If your cat isn’t going outside to the toilet, you will need to be particularly careful where you place their litter tray so that they are sure to use it. A quiet place that will afford them a good degree of privacy is crucial (away from their food and drink area) and if you have more than one cat, it’s likely that they will be put off using their litter trays if they are too close together. Animed Direct has a range of indoor cat food, scratch posts, litter trays and more, as well as being able to provide any prescribed medication your cat may need. Don’t forget to check out our range.